We’d love your help. Let us know what’s wrong with this preview of Lawless by Jeffrey Salane. Suddenly, it's very clear to M that her tutors have been preparing her all along for a life of cr The Lawless School provides the right education for kids on the wrong side of the law. To ask other readers questions about Lawless, please sign up. If you were going to name a genre for this novel, would it be more mystery? Or more action/adventure? No preamble here. We meet our main character, an adorably plucky twelve year old girl, M Freeman, as she is interviewing for placement in the prestigious Lawless School. In the blink of an eye, this reader was submerged in adventure, crime, mystery and secrets. M never really questioned anything. She was homeschooled, able to avoid the distractions and drama, often found in “regular school”. Bright and curious, M was happy with her studies and content with her life, despite having lost her fathe No preamble here. We meet our main character, an adorably plucky twelve year old girl, M Freeman, as she is interviewing for placement in the prestigious Lawless School. In the blink of an eye, this reader was submerged in adventure, crime, mystery and secrets. M never really questioned anything. She was homeschooled, able to avoid the distractions and drama, often found in “regular school”. Bright and curious, M was happy with her studies and content with her life, despite having lost her father in a tragic accident while her maternal parent was an almost absentee mother. Her trip into the city changed everything. With no time to prepare, M is yanked from her home to be dropped in the middle of who-knows-where to train for a life in Crime. That is only the tip of the iceberg. M knows that most students and staff cannot be trusted and that she alone must figure out who is friend and who is foe simply to survive the grueling training. One mystery leads to another as M discovers that her father harbored secrets here at Lawless. Soon, her potential success at Lawless fades into the background as understanding her father becomes priority. Convinced that her father left messages for her, she vows to solve his puzzle. Unfortunately, this decision places M and the few students she has chosen to trust, in danger. M will not only have to face her fears, but she will have to make potentially life-changing, split-second decisions along the way. Mr. Salane has crafted M Freeman and her story in such a spectacular fashion, that this reader found it remarkably difficult to stop reading. The intended audience for this book may be Middle School; but it is, quite frankly, too good to be that limited. Yes, it is certainly suitable for that age group; but anyone that passes this book up because of the genre is self-limiting and missing out. If you’ve had any interaction with a child between the ages of 10 and 14 you know two things; they tend to have the attention span of a gnat and almost everything gets boring, very quickly. Mr. Salane clearly understand this and he has a penned a tale that will not disappoint. After reading the first couple of chapters of Lawless, I had high hopes for this book. Jeffrey Salane throws us right into the story as we start with M’s interview for Lawless; the school of criminals. It immersed me into thoughts of fast-paced action, betrayal and drama, but after finishing Lawless, I felt under-awed and a bit disappointed. With nothing but an empty envelope with her name on it and a painstakingly crafted, hand-written speech she’d never got to deliver, M sat as the limo pulled After reading the first couple of chapters of Lawless, I had high hopes for this book. Jeffrey Salane throws us right into the story as we start with M’s interview for Lawless; the school of criminals. It immersed me into thoughts of fast-paced action, betrayal and drama, but after finishing Lawless, I felt under-awed and a bit disappointed. What am I going to tell Mom? Lawless was full of lots of little twists and turns, starting in Chapter 3 when there’s already doubts over who M should and shouldn’t trust. I loved all the unexpected happenings and how I was always left guessing at what M would discover next, but in truth, throughout most of the book, the twists were the only parts keeping me interested. I didn’t like how slow the book became. Of course, M was at a school of criminals, so the lessons were a vital part of Lawless but I felt there was just too much description and not enough action. For a book aimed at young people, I expected a lot more to happen. It took until the last few chapters of Lawless for all the quick, dramatic events to unfold. And that was the part I loved. Cars started furiously honking as they ripped past the small girl in the black parka. Lights flickered as the high-pitched squeal of swerving tires echoed in the night air. M was frozen in place, waiting to be struck by the oncoming traffic until one car pulled to her side and the passenger-side door flew open. ‘Get in now!’ cried Zara. M leapt into the car and Zara put the pedal to the metal before the door had shut, leaving M’s mother and a team of angry Fulbrights behind in the proverbial dust. All it took was some quick movements and a few more twists to get this book going. Yes, the actions were exaggerated but Lawless was a criminal school; if a bunch of 12 year old kids are training to be law-breakers, you’re bound to see some ridiculous acts! Jeffrey Salane’s character portrayals were a stand out for me in this book. I liked how, despite how he made each character differentiate from the rest with their traits, I was still always trying to guess how maybe all wasn’t what it seemed. He also did a great job of making me hate Ms Watts, with her snide remarks and arrogance. Lawless was a fun middle-grade read that I know I can get more out of when I read it again. This action-packed "spy" book is about eleven-year-old M (yes, that's her name). We're eased into the strangeness of her life till now--a homeschooled education in profiling people, spotting forgeries, taking in her surroundings, lying, planning escape routes--when she's suddenly taken from her home and thrown into a dangerous full-time school dedicated to studying those things and more. For a successful l Lawless was a fun middle-grade read that I know I can get more out of when I read it again. This action-packed "spy" book is about eleven-year-old M (yes, that's her name). We're eased into the strangeness of her life till now--a homeschooled education in profiling people, spotting forgeries, taking in her surroundings, lying, planning escape routes--when she's suddenly taken from her home and thrown into a dangerous full-time school dedicated to studying those things and more. For a successful life of crime. M's story is full of twists and crazy action and middle-grade humor. Just when I thought I'd figured out where things were headed, I realized I'd been thrown for a loop! While Lawless played the old card of "kid going off to boarding school," it did so in a fun way with a cool twist. My biggest complaint was that the main character M felt older than the 11-12 years she was supposed to be, and the ending was a bit exaggerated. But other than that, the story worked. I have such mixed feelings about this book! I loved the premise, and I loved the beginning and the action and the characters. I liked that the story kept me guessing throughout the story in regards to who could actually be trusted. However, I did not like the ending. The ending made no sense to me. I feel like it ended too quickly and too "neatly", especially since this is the start of a series. It almost seemed like the book was getting too long and Salane was told to end it. I loved the concep I have such mixed feelings about this book! I loved the premise, and I loved the beginning and the action and the characters. I liked that the story kept me guessing throughout the story in regards to who could actually be trusted. However, I did not like the ending. The ending made no sense to me. I feel like it ended too quickly and too "neatly", especially since this is the start of a series. It almost seemed like the book was getting too long and Salane was told to end it. I loved the concept of a school for thieves. I found the action engaging and interesting and I enjoyed watching them puzzle out the clues of the art work- kind of a kids Dan Brown book only not with the over all conspiracy theories that usually accompany Dan Brown's book- although to be fair this book does have conspiracies in it! I read an ARC provided through NetGalley. Chapter 1 of Lawless opens as M. Freeman is waiting for her interview for the Lawless School. As soon as M. enters the interview, her life will never be the same, for, you see, the Lawless School is a school for theives and other criminals. M. has been carefully homeschooled so that she can do well at Lawless, but was never told about the school (unlike her classmates). From the interview on, M. is being tested in one way or another, given puzzles that sh I read an ARC provided through NetGalley. Chapter 1 of Lawless opens as M. Freeman is waiting for her interview for the Lawless School. As soon as M. enters the interview, her life will never be the same, for, you see, the Lawless School is a school for theives and other criminals. M. has been carefully homeschooled so that she can do well at Lawless, but was never told about the school (unlike her classmates). From the interview on, M. is being tested in one way or another, given puzzles that she has to solve (how do I get into a mandatory commencement speech when my guardian has stolen my ID card and I cannot get through security?). While at Lawless, M. makes friends and learns things about her life and family that she did not know before. It seems though, that every time M. learns an answer, either it is not a straight answer or it leads to another question. Although Lawless is where her father went to school, is Lawless really the right place for M.? There is plenty of action in this story. Chasing, stealing, explosions, crawling through vents, all happen in this book. I think that my fifth graders who love action will love this book. You never know what side a character will be on - characters seem to change sides (for or against what M. is doing). At times it was difficult to keep track of who was on what side and why. This is not a simple "these are the bad guys, these are the good guys" type of story. M Freeman has been home schooled her whole life. Her father was her best friend, but he died a long time ago. All she knows about her father is that he attended Lawless school and loved her very much. Lawless is a school you go to to become a master criminal. When M gets into Lawless she doesn't know anything about it. After the interview when she gets home to tell her mom about it the lady from the interview is having coffee with her mom! Then the lady from the interview tells her it is time to M Freeman has been home schooled her whole life. Her father was her best friend, but he died a long time ago. All she knows about her father is that he attended Lawless school and loved her very much. Lawless is a school you go to to become a master criminal. When M gets into Lawless she doesn't know anything about it. After the interview when she gets home to tell her mom about it the lady from the interview is having coffee with her mom! Then the lady from the interview tells her it is time to go and she has to leave right now. M gets in the car and says goodbye. She doesn't know what is going on. After a long few confusing days getting used to Lawless and her new friends she finds out that she is special. She keeps finding out more and more about her father and their relationship. Finally a guy named Adams Worth asks her to join a secret group of people called the masters. M's father founded this group. M has to complete a mission to get fully joined in the Masters. She decides to steal a famous painting. Completing this mission will be very hard and scary but she knows she can do it with the help of all her new friends. The ending of this book is very confusing and hard to understand for me. M. Freeman has grown up being sheltered and believing that her parents were art collectors and historians until her birthday when she receives an interview to attend Lawless School. Unbeknownst to M , Lawless isn't an ordinary school. It is a school for spies and criminals and M is about to discover that they don't let just anyone in and that in fact she is a legacy as her father was a top student of Lawless when he was younger. Now M, has been chucked into a world where she is not only a newbi M. Freeman has grown up being sheltered and believing that her parents were art collectors and historians until her birthday when she receives an interview to attend Lawless School. Unbeknownst to M , Lawless isn't an ordinary school. It is a school for spies and criminals and M is about to discover that they don't let just anyone in and that in fact she is a legacy as her father was a top student of Lawless when he was younger. Now M, has been chucked into a world where she is not only a newbie but must use the knowledge she has been taught ever since she was a little girl during stories and homeschooling lessons in order to survive. What will happen though when it seems that whatever M tries to do lands her in trouble and then it's discovered that the reason all eyes are on her , is because of something her father didn't get to finish before he disappeared. Can M with the help of her new friends save what they are supposed to save but what happens when M's mum arrives and things start to go haywire ? Who will M save and who can M trust ? Find out in Book #1 of Jeffrey Salane's new series "Lawless". All readers who love spies and stories like Etiquette and Espionage , Spy Girl , HIVE , School of Good and Evil , Gallagher Girls and Heist Society will find themselves at home with Lawless. I got the distinct impression that the author wrote the first 240 pages of this book without being sure how the ending would work, then got writer's block, then tried to slap together something like a dramatic ending in the last 30 pages and failed miserably. As an MG book, the first 80% of the book was fun. Sure, there were plot holes, and the story was pretty simple, but I was enjoying it enough to ignore the parts that were too hard to believe. But then the story suddenly turned from "fun book I got the distinct impression that the author wrote the first 240 pages of this book without being sure how the ending would work, then got writer's block, then tried to slap together something like a dramatic ending in the last 30 pages and failed miserably. As an MG book, the first 80% of the book was fun. Sure, there were plot holes, and the story was pretty simple, but I was enjoying it enough to ignore the parts that were too hard to believe. But then the story suddenly turned from "fun book about kids learning to steal stuff like a thieves' version of Harry Potter" to "weird sci-fi apocalyptic climax where the villain wants to destroy the world for 'bragging rights.'" Yes, "bragging rights." Really a 2.5 rating, rounded up to 3. I can see how kids will enjoy this story - CRIMINALS! BOARDING SCHOOL! HIJINX! - but I wasn't feelin' it. This definitely felt like the author's first book and it needed a lot more editing to tighten the story. Things felt very scattered and I never really understood the characters' motivations at all. I just didn't get why they were doing any of this and while kids may not necessarily be able to put their finger on what bothers them, I think they'll sense th Really a 2.5 rating, rounded up to 3. I can see how kids will enjoy this story - CRIMINALS! BOARDING SCHOOL! HIJINX! - but I wasn't feelin' it. This definitely felt like the author's first book and it needed a lot more editing to tighten the story. Things felt very scattered and I never really understood the characters' motivations at all. I just didn't get why they were doing any of this and while kids may not necessarily be able to put their finger on what bothers them, I think they'll sense this too. Also, I'm feeling pretty sick of the kid suddenly discovers that they are amazing at something they never expected to be amazing at and now their life is wildly different trope. Yeah, we all have strengths, but I'm about done with that storyline. This one varied a little bit since the character was raised to develop certain skills, but still, it felt trope-y. This book was amazing! I absolutly loved the humor about the ending-unexplained so there are no spoilers-and the characters were fabulously designed. I felt a little disappointed when most of the questions asked in the book weren't answered by the ending,and I know there will be a another book but still there ought to be more answer's than that... :) otherwise great job Jeffrey Salane! I love this book! It has a very exciting plot line and I would highly recommend it. I want to go to Lawless school, except for the fact that it is for criminals. The classes sound very fun and exciting. If you enjoy this book, I would read H.I.V.E. They are very similar and are both very good. Also, H.I.V.E. focuses more on boys whereas lawless more hones in on girls. I could see this being a fun pair to Gallagher Girls or a ladder to Heist Society. I really want to give it 2.5 stars. Very cute and entertaining for the age range, I guess. Just very unbelievable for a 12 year old girl and one of the BEST examples of Mary Sues I've ever read. What scares you the most? Is it spiders? Sharks? Ghosts? Whatever your answer is, many people can agree that big changes like family members dying, or adapting to new daily routines. Both of those things happened to M, a high school teenager whose parents, or parent, was involved in, heists, she is yet to learn about. M Freeman might just be the most attentive, over prepared freshman anyone might know. Every aspect of her life has been preparing her for a school, a secret school, that trains young adults to be the perfect criminals. Jeffrey Salane writes on the cover, “The right school for kids, on the wrong side of the law”. This quote already makes the novel a good read for middle school students. The author of Lawless, as you might already know his name, Jeffrey Salane does an exceptional job of portraying the characters in a way that hooks the reader into the book. Recently, I saw that the sequel to Lawless was published. I am really looking forward to reading it, as I was very pleased with the first book. the book lawless by Jeffrey Salane deserves 5 stars . this book gets better every time I turned a page. I loved how he included real life art into this story and how he related it to M's mom who does identical paintings like the ones in the museum that costs thousands of dollars. M passed all her with flying colors. the book is very creative and mysterious all at the same time. I would have given this a 3 for an average read, but Jackson insists he loved it and would rank it a 5, so I'm splitting the difference to go with a 4. It's a fun story about a girl learning about herself, her mysterious parents, and the new life she's thrust into with transitioning to a secret school. Well written. Well thought out. Good concept. M Freeman has always been able to see things that others overlook, read expressions of other people, and read situations for what they really are. Little does M know that she has been trained to a be thief until she is whisked away to a school for thievery. While she is there M must figure out who she can trust and who is out there to steal your trust. Good for 3rd grade and up. M. Freeman has always known her life has a purpose. But does she know what her purpose is yet? Does she know what 'side' she will grow up working for? Does she know the true story about her father? This story has multiple plot twist that will make you so surprised! Quiet 12 year old M Freeman thinks she has a normal life. Sure, her father died in a plane crash when she was younger, but the crash was an accident… right? And sure, she’s home schooled and doesn’t understand other kids, but of course that’s only because M keeps to herself and is very busy with her studies. Or is it? The book starts off with M going to an interview for a school called Lawless. The hosts, a woman named Ms. Watts and a girl about her age who goes by Ms. Smith, ask her questions Quiet 12 year old M Freeman thinks she has a normal life. Sure, her father died in a plane crash when she was younger, but the crash was an accident… right? And sure, she’s home schooled and doesn’t understand other kids, but of course that’s only because M keeps to herself and is very busy with her studies. Or is it? The book starts off with M going to an interview for a school called Lawless. The hosts, a woman named Ms. Watts and a girl about her age who goes by Ms. Smith, ask her questions that to any other kid would seem suspicious, but to M they’re just normal. Questions like, “how would you exit this room?” and “how many stories are in the neighboring building?” Then they give her an envelope. But near the end of the interview, Ms. Watts asks Ms. Smith to leave. Then she turns to M and tells her to forget about Lawless and everything that just happened. She instructs M to burn the envelope at home and scatter the ashes. However, on the ride home, M’s curiosity takes over and she opens the envelope… only to find it empty. Discouraged and confused, she burns the letter when she gets to her house. A message is revealed by the flames, “DON’T TRUST ZARA,” then the letter turns to ashes. So M’s journey at Lawless begins. She starts pulling mastermind stunts, earning both friends and foes. But at a school for criminals, everyone’s got a story and there’s no one you can trust. Join M as she breaks into secrets about her family, teachers, and friends; connecting the dots to create a picture no one saw coming. I would give this book a 3.5 out of 5 stars. Why? Though it was a great read there were way too many flaws. First off, the main idea wasn’t all that inventive. There are so many books with the same ‘special school’ concept; take, for example, the Harry Potter series. However that first reason didn’t affect my rating much at all, I usually don’t mind that kind of thing. What really left a bad impression was the weak, rushed, and unclear ending. It made no sense whatsoever and was all too good to be true. It was one of those bad endings where it concludes too much for there to obviously be a sequel but leaves some questions unanswered. There is a sequel, “Justice,” that I haven’t read yet. To sum it all up, the writer is clearly inexperienced. Another thing I really didn’t like was that the main character was all too perfect and unrelatable, pulling stunts that seem unreal for someone of her age and abilities. As one review criticizes, “pretty sick of [when] the kid suddenly discovers that they are amazing at something they never expected to be amazing at and now their life is wildly different...” I agree with this statement. Sure, she was schooled in crime, but she didn’t even know it! Also I got the sense that her homeschooling didn’t include gym class, yet she seems to be acing PE at Lawless. I mean, seriously: she faces her biggest fear by page 50! You could counter that it adds more action to the story, but even though I agree, the author should have toned down on M’s abilities. Fourth, the time period was unclear and unrealistic. Judging by the technology, clothing, and characters, the time period seems to be about 10-25 years into the future. However, their gym, ‘The Box’, is out of place; it seems like it would be invented in 50 years… at minimum! Fifth, the characters were unrealistically emotional. After one of her friends reveals a secret that doesn’t mean much, she tries to avoid him at all costs, and he’d been one of her best friends! After the same guy does something you have to admit is mean, they shun him and hate his guts, which is a little over the top. Why? Because he did it to get back at someone who was mean to M. Sure, he was a bully, but with good reasons. Sixth, while the book’s events could happen, the ending is much more unrealistic. Relating back to my fifth reason, it’s out of place like a puzzle piece that doesn’t fit… even though it’s one of the most important ones! Finally, characters had been poorly created. One of her friends, Merlyn, is a total stereotype nerd, and Cal you don’t know much about. Almost all M’s friends have only 1 trait and are uncomplicated. So why did I rate this book a 3 and not, say, a 1? Because it was very intriguing and a complete page turner. So interesting, in fact, that it was hard to put down and so full of action I couldn’t help but ignore some of the book’s flaws. I enjoyed the premise of the book (who wouldn't want to train as a master criminal??). The ending felt jumbled and some pieces were a bit too convenient. This book is okay for younger readers but I'd not pursue any further books of this character or story-line. Meh. This book unexpectedly reverted from the path it was leading. It’s unforeseen mystery, inexplicably made show in the end making the whole experience of the book rememberable. Before I start to get all criticizey, let me just say Lawless is a good book. Not awful, and certainly better than others I've read. Still, it was lacking some elusive quality that would have elevated it to greatness. I liked M. I thought the plot was interesting and clever. I'm a big fan of clever-criminal books, in general. The author's voice was very natural and readable. And I did stay up until one in the morning to finish it. Now that that's out of the way, this review is about the three mai Before I start to get all criticizey, let me just say Lawless is a good book. Not awful, and certainly better than others I've read. Still, it was lacking some elusive quality that would have elevated it to greatness. Now that that's out of the way, this review is about the three main reasons Lawless was a good read, but not a truly great one. First, the characters are, at the same time, too developed and not developed enough. Instead of having major and minor characters, Lawless seems to have most of them hovering around a middle ground. I felt like I knew Foley about as well as I knew Cal, which was also as well as I knew Jules and M's mom. Jones makes a few appearances, and we get some information about him, but then he vanishes without a trace. Everyone in the Masters club sort of blurs together, and they don't seem like they're very important, but some still got names and descriptions. M's friends drop out if the story entirely for a few chapters. Yes, they come back, but I really wasn't sure they would. I feel like that's not a good thing. There was too much middle ground, too many false cues. I wasn't sure who would turn out to be important and who was just background. See? Too much development and not enough, simultaneously. I like knowing exactly who the major and minor players in a story will be. Reading this book, I wasn't exactly clear on that. Next comes the plot twist issues. Firstly, they were all clustered around the second half of the book. We went from moving at a slow, leisurely pace at the start -- M going to classes, researching a particular painting, trying to figure out pretty basic stuff -- to a big reveal every other chapter. Plus, suddenly the world hung in the balance. When did that happen again? It was exciting, to be sure, but also a lot like the finale of a fireworks display. You don't really get enough time to marvel over each individual reveal before you're rushed along to the next one. Overall, it makes the surprises seem less important, since they're all smashed together. The twists themselves are cool -- they just need a little space in between them. Finally, we come to the ending. I think this book was missing two slightly clichéd, but still important speeches. First, the evil-villain-scheme speech. I'm pretty sure I got most of it, but I don't think you should have to go back and reread to figure out what the heck happened. I admit, I did not see it coming. It's just, I'm still not sure what it was I didn't see coming. The second missing speech is the Dora-esque here's-what-we-did-today one. There were too many loose ends for my taste. I'm almost entirely certain a sequel is being set up here, but that's no excuse. The reader should feel energized, joyous, and at peace when they finish a book; they should not sit staring at the back cover, dazed, trying to piece together what they just read. I could have used a quick recap here, too. Just a small one. Additionally, the book seemed to end right after the climax. I wasn't ready for that, not at all! I could have used a little more time at the end to wind down, process what happened. I felt like I would have liked the book more if it was just like five, ten pages longer. Only a hair longer, really. So, these were some things I found lacking in Lawless. And, I know, there could be perfectly good reasons for a lot of it. Perhaps characters that are less important in this book will come back with a major role in a sequel. The abrupt ending is probably to keep you hungry for the next installment. Maybe the author did recap at the end, and I just missed it. But I still stand by my review. If the characters are going to come back, tone them down until their big moment. If you want to set up a second book, finish the first one first. And if I missed out on subtle clues and summaries... well, sorry. I kind of start to skim when I get excited. Next time, when you include a clue or explanation, please brain me over the head with it. Amazing read! Very well detailed and explained. The only thing is that it was very confusing with her name being M, so sometimes I didn't know if it was her, or somethingelse. Don’t judge a book by its cover. It’s a phrase we’ve all heard repeated so often it’s become cliché. Appearances can be deceiving; that’s a lesson learned by Lawless heroine “M”. Unfortunately, it was also my experience with this novel. The cover held so much promise — a cool spy girl, I thought. And the story got off to a decent start. My curiosity was piqued by the opening chapters. M is an unusual girl, a little strange, in fact. Her upbringing has been most unusual. And when she has a mysterious interview for The Lawless School, it looks like the cover tease is going to pan out. This is where I should mention that Lawless is a debut novel. And debut novels generally have their pluses and minuses. Many authors are still learning to fine tune their skills. Though still able to be enjoyed, Lawless suffers in two areas. The first problem is uneven pacing. Once M makes it to the Lawless School, too much time is spent in classes whose assignments involve competitions pitting the students against one another. What was at first entertaining soon became repetitive and didn’t serve to further the larger plot action. Within the time at the school, I felt there were avenues of world building left unexplored. Surely, we could have looked deeper into some of the things mentioned in passing so as not to have things feel samey. The second shortcoming is harder to overlook. Many reviewers have spoken of plot holes in the novel, and by “plot holes”, I’m never sure whether folks refer to implausible circumstances, gaps in continuity, or things that just plain don’t make sense. Certainly, there are some events that are implausible, and that’s to be expected in this type of book. But the biggest issue was that I was too often left scratching my head and turning the pages back to check that I hadn’t missed something. When this kind of thing happens, I can look the other way once. The error, for Salane, was repeated infractions. By the time I’d reached the end of the story, I was convinced there must have been some missing chapters. Reading Lawless feels like an odd kind of game where Jeffrey Salane withholds key information without dropping hints or clues, only to later bring something to light in an astonishing reveal or reversal. Unfortunately, that’s not the kind of caper I had anticipated. Verdict: 3 of 5 hearts. An Intriguing Beginning That Never Quite Takes Off. Lawless is the kind of book I just wanted so badly to like. While it’s not without merit, there were too many unanswered questions. Too many times where things just didn’t make sense. Though I can’t say that Lawless was a dizzying tale of action and intrigue, it did leave me dizzy. I gave this book to my 10 year old daughter for Christmas and at first, she seemed to be doing well, and then a quarter of the way in, she stopped completely. Curious, I asked her not to tell me about the book (we normally talk shop on the books we are reading) and I dove in to see what the problem was. The first thing I noticed was that our main gal M who was 12 years old acted and thought much like a 30 year old. Sure, you can say she had a different type of upbringing and her maturity was far I gave this book to my 10 year old daughter for Christmas and at first, she seemed to be doing well, and then a quarter of the way in, she stopped completely. Curious, I asked her not to tell me about the book (we normally talk shop on the books we are reading) and I dove in to see what the problem was. The first thing I noticed was that our main gal M who was 12 years old acted and thought much like a 30 year old. Sure, you can say she had a different type of upbringing and her maturity was far advanced, but why would you want to advance her so much that young readers around her own age cannot relate? The second thing I noticed was the language being used throughout the story. If you are writing for junior fiction readers you are not aiming to be a thesaurus. Words like infringement are high level language more suited to young adult or adult fiction. Also bogging our story down were descriptions of every building and landscape that again, were fairly high level for the junior genre. Instead of saying she scanned or looked over a room it is written she 'canvassed' the room. I'm not saying you have to write a low reading level book to appeal to the majority of junior fiction readers, but at the same time, books need to be fun and relatively easy to skip through when you are writing a heavy adventure novel like Lawless. As an author, Jeffrey has done his homework and we learn quite a bit about art history - in particular artist Rembrant, but it is bogged down by all the double crossings, jumping countries, shrouded mysteries from the past and after a while the multiple combinations of plot complications made my brain feel too heavy. I was curious how and where the cliff hanger would leave our characters, but was slightly relieved to be finished as well when I got to the ending. This is a truly high end junior fiction novel and despite it having a female main character, the content and meat of the story, in my humble opinion, makes for a better boys book. 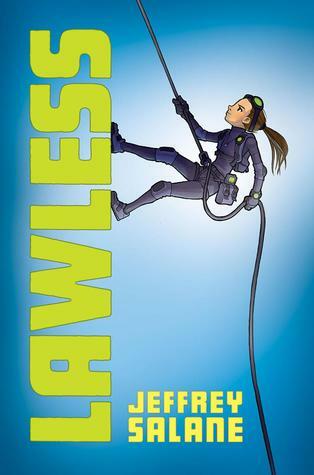 Jeffrey Salane's debut novel Lawless, creates a far-fetched middle grade story which proposes that a school exists for children to teach them how to be outstanding citizens--not outstanding law-abiding citizens, but mastermind criminals in the making. An exciting play on the traditional spy novels with the twist being readers are reading from the “bad guys” perspective. Don't let the dubious dealings fool you, the unrealistic events make the book all the more entertaining as Salane introduces the reader to a cast of intelligent, albeit crooked children, the lead sleuth being M. Freeman. What can be said for M? Well, if Jason Bourne were a twelve year old girl, he would most definitely be M. Freeman. The gender neutrality of the protagonist's first name is just one element that establishes this novel as a book accessible to both boys and girls. Written in third person format, the novel thrills with its onslaught of fast-paced verbiage, that at times can leave the reader a bit confused at the happenings. “Did I accidentally skip certain sentences? Did the author leave out a chapter or two?” No, that just seems to be Salane's writing style, so if the reader wants to stay aware of the characters' surroundings, it's best to be keen; one may have to re-read a few pages to comprehend the logistics. Although the writing is fast-paced, the storyline at times drags, crawling towards the three-quarters mark before truly gaining appreciation and coherence of the plot. Despite the hang-up, readers may overlook this and become a repeat offender of Salane's work as Lawless is only the first book in the series. Be on the lookout for the follow-up, Justice. Even among criminals there seems to be some sort of moral code, so who's really the crook in the book? You decide.